Yay, a yoga mat bag! FINALLY. Measure the circumference and length of your rolled-up yoga mat. Cut your fabric. You’ll get one rectangular piece (circumference x length) and a round piece for your bottom. Add a two-inch allowance to your rectangular piece. For the round piece, I am sure that there is a formular somewhere for getting the exact measurement. I eyeballed mine and used my rolled-up yoga mat as template. 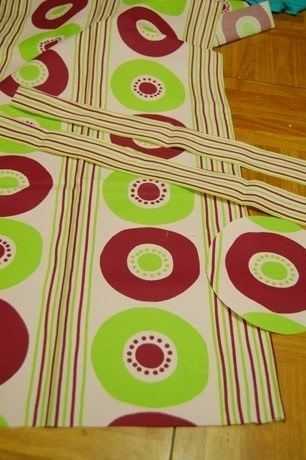 Cut the same pieces for your lining. 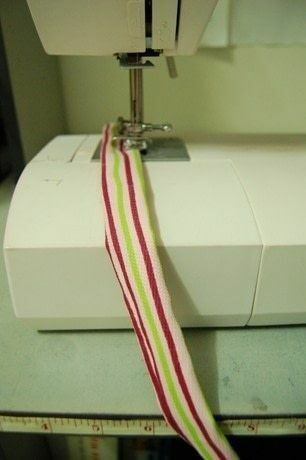 You should also cut 2 strips for your strap. 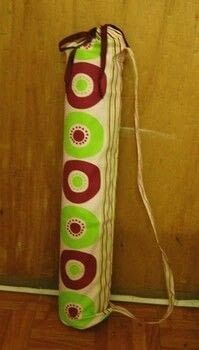 Mine was 33 inches long and 1.25 inches wide. 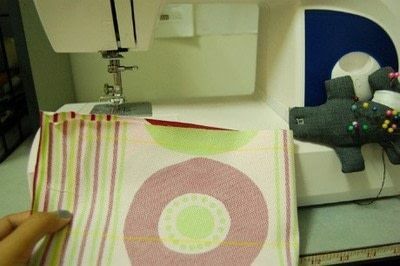 Start sewing. Start with your strap. 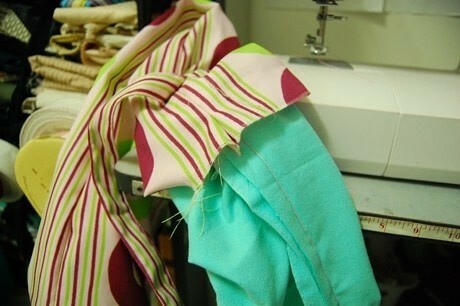 Turn inside out and topstitch. Fold your rectangular piece, lengthwise. Right sides together. Sew the long side, starting two inches from the edge, but on one side only. 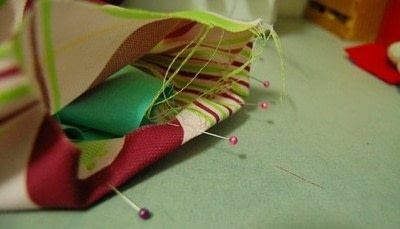 Sew all the way to the other end. The unsewn part is for your drawstring. Mark three inches inches from where you started sewing. Pin one end of your strap. The position should be the same as the picture below. 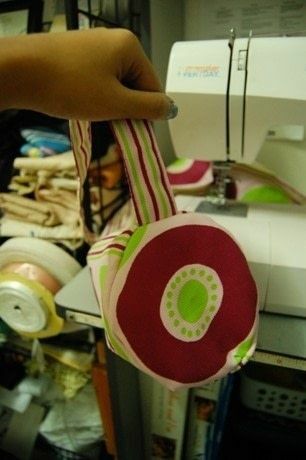 Sew your strap to the bag. Be careful not to sew the other side of the bag. Reinforce this part by sewing across the strap several times. I used zigzag stitch. 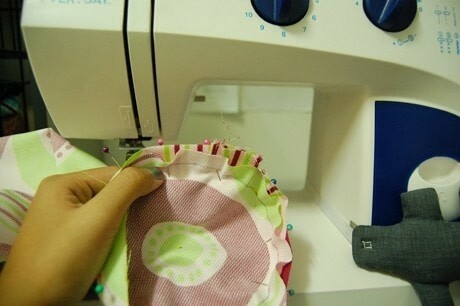 Take your circular part and pin it to the bottom of your bag. This would be the side opposite to where you sewed the strap. Make sure that you sandwich the other end of the strap between the circular part and your bag. In the picture, the strap is between the pink and blue-ish pins. Sew them together. Turn inside out. After that, your bottom (well, not YOUR bottom) will look like the one in the pic. 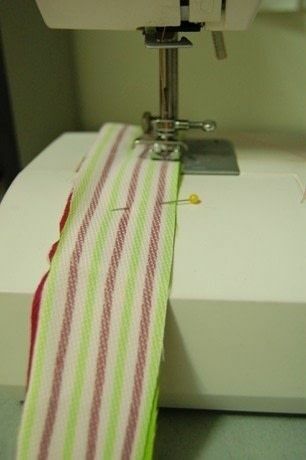 Sew your lining using similar steps. 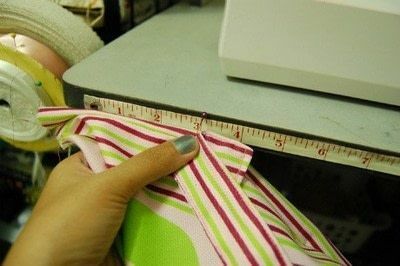 There is no need to start several inches from the edge when you’re sewing the rectangular part of your lining, though. 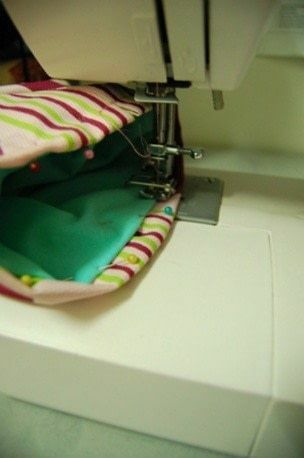 Insert your lining inside the external part of your bag. 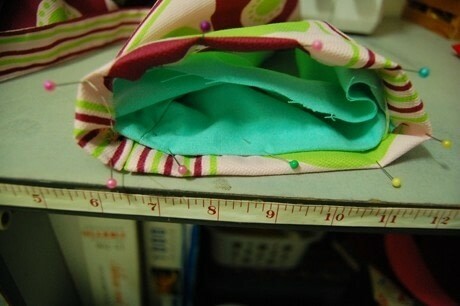 Now fold 1 inch of the bag towards the lining. This is the piping for your drawstring. Fold 1/4 inch of the lining towards the part that you folded in Step 13. This would lock your piping nicely. 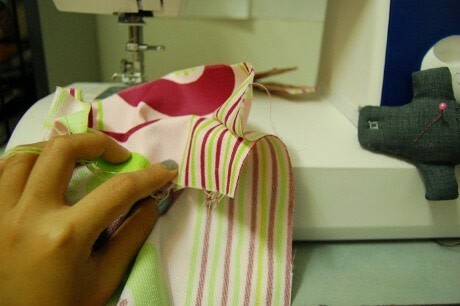 Sew together. 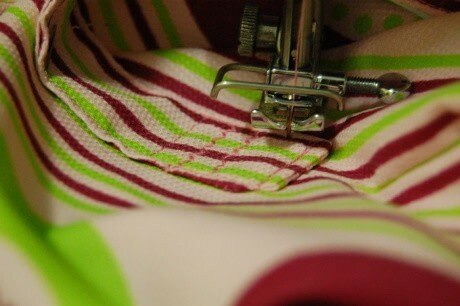 When you’re done, you will have a hole where you can insert your ribbon. Whaaaaaaaa!!! *w* this looks great!!! I really need one of these!!! Thanks a lot!! yep, pretty easy. it's a simple drawstring bag with a side handle and round bottom. This look so easy to make! And I really need one!